Drexel is a comprehensive global research university committed to use-inspired research with real-world applications. Drexel has committed to being the nation’s most civically engaged university, with community partnerships integrated into every aspect of service and academics. Wexford Science & Technology, a BioMed Realty company, is a real estate investment and development company that meets the growing and specialized facilities needs of for-profit and not-for-profit institutions, including universities, university-related research parks and healthcare systems. Wexford Science & Technology’s objective is to become a long-term partner, support strategic organizational growth in significant, value-added ways while strengthening the communities in which they work. The Philadelphia Redevelopment Authority pioneered the Percent for Art Program in March 1959, becoming the first city in the United States to create a program requiring developers to commission art as part of the development process. The Redevelopment Authority’s Percent for Art Program obligates developers who are building on land acquired and assembled by the Authority to dedicate at least one percent of the total building construction costs toward the commissioning of original, site-specific works of art. Since the inception of the Program, nearly 400 works of public art have been installed in all areas of Philadelphia. Works of public art can be found in such diverse developments as high-rise commercial and residential towers, housing for families and the elderly, shopping plazas, parks, hotels, universities, schools and libraries. Barbara Hennequin is an Amsterdam-based graphic designer, working in both the commercial and cultural fields. Her work consists of the design of visual identities, websites, books, magazines, brochures, and other publications. In addition to her practice she give lectures, teaches and gives workshops on a regular basis. 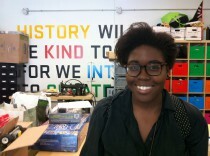 During our working period at the Department of Making and Doing, Adesola was our intern there. By the time we figured out that we were going to make a podcast as part of our project, we immediately knew who to ask as ‘the voice’: Sola. Although she was not directly involved in our project we were very glad she said yes. 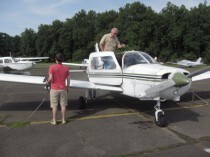 Via Air is a small flight shool located at the Northeast Philadelphia Airport. They generously granted us permission to make audio and gps recordings during one of their flights. 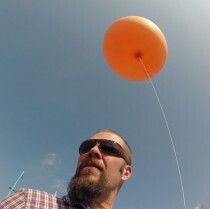 Sean McGinnis is a software developer, hardware hacker and balloon/kite mapper from just outside of Philadelphia. Sean together with Edward Farrel is developing software for the project. Daniël Maarleveld, is an Amsterdam-based graphic designer and typographer. He also creates evolving letters and whole alphabets, like our project logo.